Shotlists from Fountain Screenplays — Slugline. Simply Screenwriting. Slugline is all about the writing experience. But the Fountain screenplay format is about more than that. Plain text is great for writing, but it's also a perfect archive format. And since it's compatible with anything, it enables some cool production workflows. Fountain's Notes [[like this one]] can contain any text you like, including multiple paragraphs. Since Notes don't print, you can use them to store all kinds of useful information, such as notes on revisions, character bios, or even text that can have special, nerdy powers. BOURNE running in the sun. [[SHOT: WIDE of BOURNE running on the beach.]] A punishing pace along the sand. Moving strong. Effortless. Deep into it. Focused. [[SHOT: CU BOURNE running, his face intense.]] The stunning conjunction of sun and scenery are lost on him. It would be a simple matter (for a nerd) to hack up a script that would spit out only the Notes that start with "SHOT:", grouped by Scene Headings. Instant shotlist from an annotated screenplay! A "simple matter" that's well beyond me, of course, so I pulled a lazyweb (in the best tradition of my involvement with Fountain) and asked folks on Twitter for help. 1. Exterior establishing, Scott's SF apartment. 2. Wide, Scott's apartment. Scott is painting at an easel. 1. Scott at the mailbox, opening, sifting through. 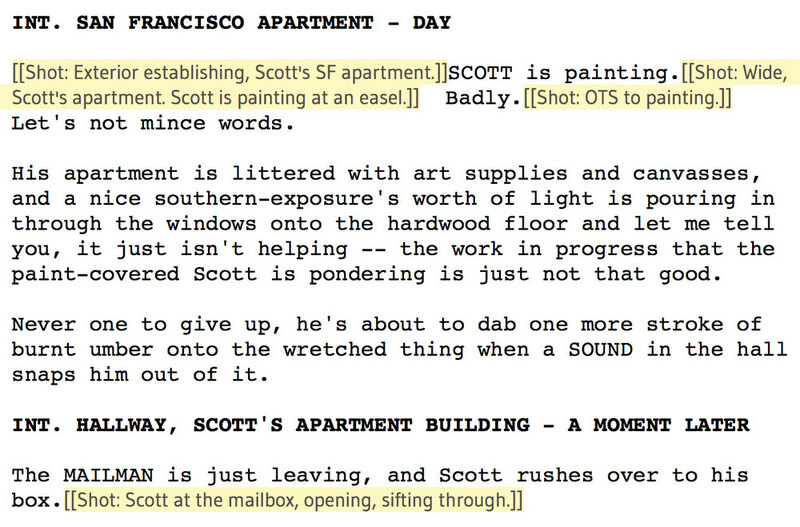 Exterior establishing, Scott's SF apartment. Wide, Scott's apartment. Scott is painting at an easel. Scott at the mailbox, opening, sifting through. You can use a Markdown-aware text app such as Byword or Marked to export or print a clean, attractive shotlist, automatically generated from your screenplay. 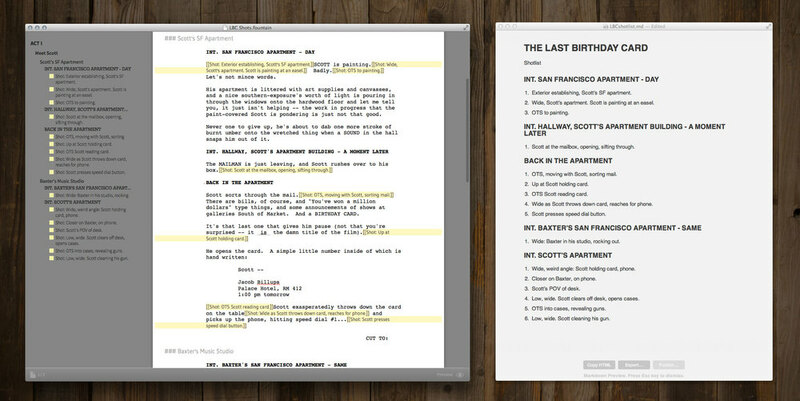 Shotlist from Fountain.app – A standalone Mac application. Drag your Fountain files onto it, and it creates a new TextEdit file containing the shotlist. Shotlist from Fountain.workflow – The Automator workflow Matthew used to create the app, in case you want to customize it. shotlist.pl – The original Perl script. LBC Shots.fountain – A sample Fountain file, so you can try this workflow yourself. This is just the beginning of what's possible with simple, open, plain-text formats like Fountain, and we hope to see many more tools like this. Fountain is an ecosystem, and as the number of apps and services that support it grows, the fundamental design premise of Slugline is strengthened. We get to focus on providing you with the simplest, best writing experience possible, without needing to clutter the app with every imaginable feature. Your Fountain screenplay is infinitely compatible, portable, and future-proof; and easily becomes the basis of any variety of custom workflows.